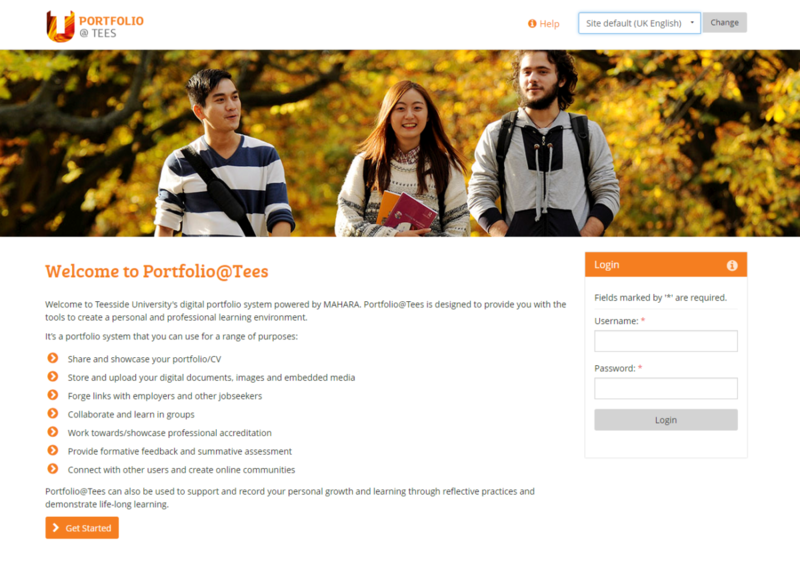 Portfolio@Tees is Teesside University’s ePortfolio system, powered by Mahara. Mahara is a powerful, open-source ePortfolio platform which is used widely across the HE sector both in the UK and around the world. In a nutshell, it is designed to provide you with the tools to support and record your personal growth and learning, through documenting activities and through reflective practice. It can be used to showcase key transferrable skills and to evidence competencies. LTE was responsible for the implementation of Portfolio@Tees and is currently leading on promotion of Mahara and CPD across the institution. The easiest way to access Portfolio@Tees is via Blackboard. After logging into Blackboard, click on the Portfolio tab and click Start Portfolio@Tees. You can login with your normal University username and password. The system is currently available for all staff and students to use. How is it currently being used at Teesside? The Food Sciences Team has successfully embedded Mahara into the curriculum over the past three academic years. It has been used for both formative and summative assessment, helping students to develop and showcase key competencies in relation to their subject-specific knowledge and therefore enhancing employability prospects. Students have developed CVs and personal statements using the ePortfolio system, as well as producing literature reviews for research purposes and reflective essays. The system has also been used to co-ordinate the management of group project work and for students to evidence their individual engagement and contribution within the groups. Read more about the implementation of Portfolio@Tees in Food Sciences. The University’s PgCLTHE programme team has recently adopted Portfolio@Tees for the “Developing Academic Practice” module. Students are required to develop an ePortfolio which contains a project proposal, a learning contract and a CPD reflection. ePortfolios can be submitted via Mahara and the programme team are able to provide feedback to students using Mahara’s commenting functionality. Students on all years of the BSc (Hons) Dental Hygiene and Dental Therapy programme in SoHSC are required to produce a portfolio for assessment which provides evidence that they meet key competencies related to the discipline. With the support of LTE, Mahara has been introduced as an assessment tool to replace paper-based portfolios. Mahara’s “Smart Evidence” competency framework is being used for the first time to manage the evidencing and assessment of competencies. The BA Education Studies programme are using Mahara for both formative and summative assessment purposes. Students are required to produce an ePortfolio which contains several elements including a CV, a personal statement, a detailed SWOC analysis which covers various skills (practical, professional, academic etc.) and some reflections on progress towards targets and development of employability skills through work experience / volunteering. Are training sessions available to help me with Portfolio@Tees? Yes, LTE are equipped to deliver CPD sessions on Portfolio@Tees and also provide individual support where necessary. For more information, please contact elearning@tees.ac.uk.